Complimentary product was provided by Adagio Tea for me to try and share my experience. Several of my friends had been sharing about Adagio Teas through Facebook, so when I was invited to try some of their products, I was excited to discover what they offered. I explored their different products and decided on a mix of full size bags and sample packs, to maximize my taste experience. Most of their teas are loose leaf, but they do offer some pyramid bag items too. I decided to stick with all loose leaf varieties for my experience. I ordered two Rooibos varieties - Rooibos Vanilla and Rooibos Caramel. If you aren't familiar, from the Adagio site I share the following description: Hailing from South Africa, red bush tea is caffeine-free and produces a sweet, flavorful cup. I also ordered two Herbal Tea varieties - Peppermint and Raspberry Patch. Lastly, I tried out the Hot Cinnamon Spice tea. It is a flavored tea, which is not caffeine free, but is one of my favorite flavors. 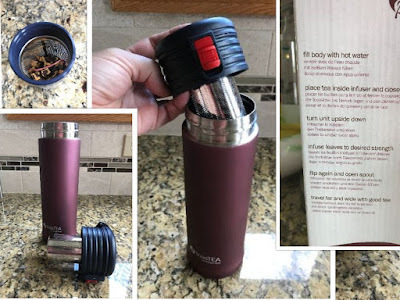 I also decided to check out the toasTEA Portable Tea Infuser. I have enjoyed using this infuser to try out all of the new teas. It is easy to use and I love that it relies on inversion to brew the tea and that when you flip it back upright the leaves are above the water line and no longer brewing. In addition, the insulated tumbler keeps the tea hot for a long time. I typically poured the tea from the tumbler and put it into an open mug, because to me drinking tea is a full sense experience and the open mug allows for full immersion into the aroma and the visual aspects of the experience, in addition to the taste. Each tea provides the amount of loose tea to use per cup and the temperature and time for steeping. The Raspberry Patch is my favorite of the teas that I tried. It offers a full flavor of summer raspberries with an appealing sweet, berry aroma. I added a small drizzle of honey to provide a sweet flavor match to the sweet aroma. This is the one that I go to for a mid-afternoon tea break. The two Rooibos varieties have a nice, soft aroma and an appealing flavor with notes of vanilla or caramel. I find them to be a perfect evening treat with a drizzle of honey and a splash of milk, and occasionally a couple of thin ginger crisp cookies for dipping. The Peppermint is refreshing and I have found it a great way to start the day, paired with a couple of slices of toast. I haven't tried the Hot Cinnamon yet, mostly because it feels like a fall flavor and hasn't been the one that drew my interest when I sat down to enjoy a mug of tea. I love that the toasTEA infuser makes 17 oz of tea, perfect to have a first cup and a top off to warm the tea back up in my mug. It also is a great travel option and allows me to steep my tea on the drive to work and enjoy it on arrival. The Rooibos Caramel seems to have a few more fines in it than the other teas and resulted in a bit of the tea coming up into the drink spout while inverted. Otherwise, it has worked fine with all of the teas that I have brewed and even on immersion, does not leak. My only concern is that the tea comes in a stand up pouch with a zip closure, which makes storage a bit of a challenge. I think that I need to find a basket that I can set in my cupboard to corral them and keep them from falling over and 'disappearing' under other items in the cupboard. Or, if I stick with a few varieties only, I might pick up some small glass storage containers that I can put the tea in and place in cupboard. Have you tried Adagio tea? What is your favorite? No compensation was received for this review. All opinions expressed are my own or that of my family. Complimentary product was provided for my review.